An Italian cafe experience at home. How? Well, a simple and affordable option is an espresso machine. Affordable, when you look at the experience it sells. Don’t look at the product only. Not only do you get the best espresso shot at home, but these machines also sell an experience. The cafe experience. It can be the best gift for a coffee-enthusiast or a coffee-lover even. Oh, and coffee is not the only thing you can make. Not many people say no to a mocha mousse. So, how to tell a good espresso machine from a bad one? Well, you can’t it’s a subjective issue. But here are a few things to look at, while buying one. Your need: Why are you buying an espresso machine? Is it just for a fine shot of espresso? Or, do you want to make some cappuccino as well? How often will you be using it? Just for you? Or, to serve a lot of people? Power Consumption: You have a lot of appliances at home that eat up your electricity bill. That’s why electricity consumption becomes an important thing to consider. Easy to use: An espresso machine is an appliance that for the past century at least, has been used in cafes, not in domestic houses. It’s not the only appliance that has undergone this change and one of the problems with such appliances is that they aren’t particularly simple to use. That’s why, learn how to use it, choose one that’s easy to use and isn’t too complicated. That way you will be more satisfied and less frustrated. We have also picked our own choices to give you more idea and information about top air espresso machines in India.Check the below list and choose one that can best serve you. Here are five espresso machines that are available online. They will give you an insight into, what they are and how they can be used. 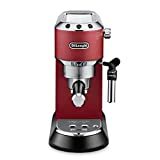 As the name suggests, this model by Morphy Richards uses 800 Watts of energy and it can be used to make not only, an espresso shot but also cappuccino and caffe lattes. You can use it to make 4 cups of coffee at one sitting. It weighs 2.8 kgs and comes with a heat resistant lid. So treat yourself to not one, but four cups of delicious coffee and don’t worry too much about it’s cleaning. That’s easy too. This is quite an expensive espresso machine but it can be used as both, a hot water kettle and a coffee maker. Because of this dual utility, you can use this machine to even make tea, or premix soups. It’s completely automatic. In one sitting you can make yourself two delicious cups of perfect coffee. You can expect some of the best coffee you have tasted before, attributed to its sophisticated features and its stainless steel filter that ensure the coffee powder really is fine. You want quick coffee? This is the espresso machine for you. All it takes is just half a minute to make your espresso shot and you are good to go. It has backlight indicators, a 24-ounce water tank, convenient power cord storage and much more. The product weighs just 4.1 kgs which makes it quite easy to carry around. This espresso machine comes with a lot of features. Nobody wants to waste energy. So tackle this problem, it’s programmed to shut off automatically if it is kept idle for 90 seconds, or longer. The water tank that comes in this has the capacity to hold more 1.5 liters, while the milk tank can hold 480 ml, to be precise. You have the option of using it to make one cup, or two cups of coffee in one sitting. 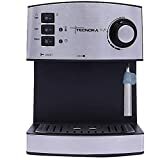 It’s easy to clean, it’s easy to use and it’s not too heavy on the pockets, making it one of the ideal espresso machines in its price range to grace the market. This really is one of the most expensive espresso makers out there. It’s equipped with multiple features which you aren’t going to find in your ordinary espresso machine. There is a pre-brewing option that comes with it, which enhances the flavour of the coffee before itself. You can adjust the strength of your coffee to your tastebuds. What’s more is that you don’t even need to spend too much on its maintenance. It comes with automatic cleaning and de-scaling functions. For those of you who really want the cafe experience at home, this is the one.